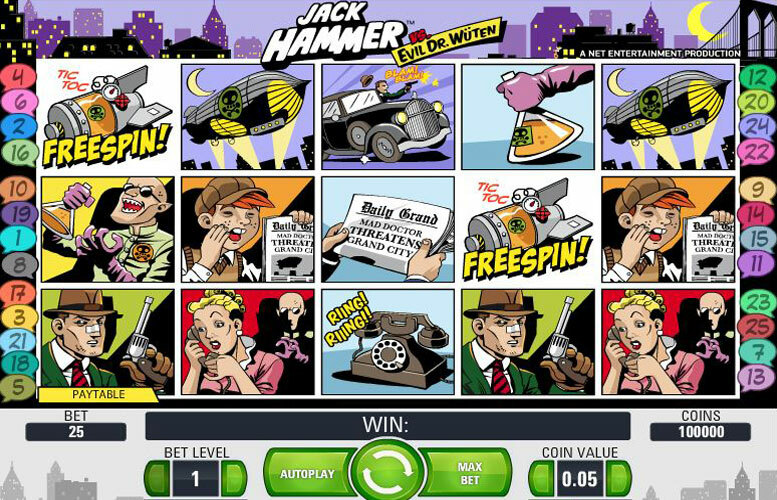 The Jack Hammer slot has one of the biggest top prizes, at 250,000 coins, available on any online slot. It offers players the chance at regular payouts with free spins, wilds and a sticky wild which can yield some really big payouts. Take it for a spin, you won’t regret it! 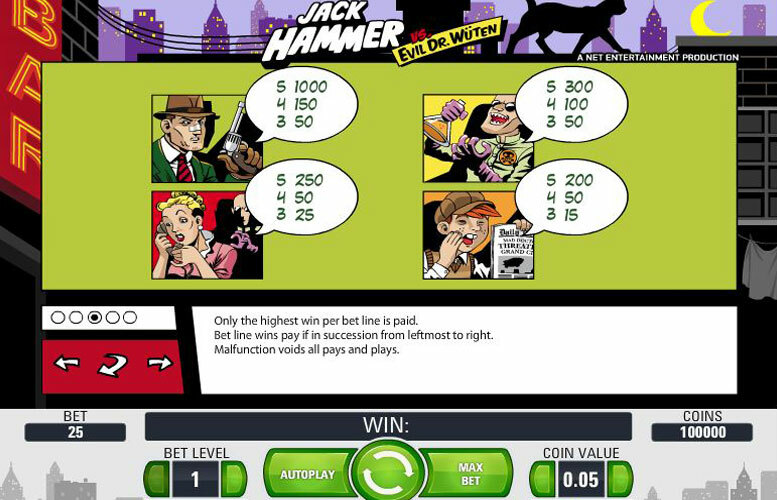 Jack Hammer is a comic book style slot machine that revolves around the hero Jack Hammer who has to save the world from the Evil Doctor Wuten and his wicked schemes. Players accompany the hero on his adventure to defeat the evil villains and restore peace to the city. On the way, players can win numerous payouts and a top jackpot prize of a whopping 250,000 coins – one of the biggest wins possible outside of progressive machines. Do you think you have the guts to accompany Jack Hammer as he goes on his adventure to rid the world of evil criminals that are posing a threat? Could you be that lucky player that gets to lay his hands on the jackpot? Well… you won’t know until you take it for a spin. The Jack Hammer slots game offers a major jackpot prize of 250,000 coins alongside the regular payouts listed on the paytable. This is won by activating, and getting lucky during, the Sticky Win feature – more on that below in our paytable section. The top regular jackpot is worth 1,000 coins while the second highest jackpot is worth 300 coins. Players can bet on all 25 paylines of this 5 reel slot to increase their chances of winning. 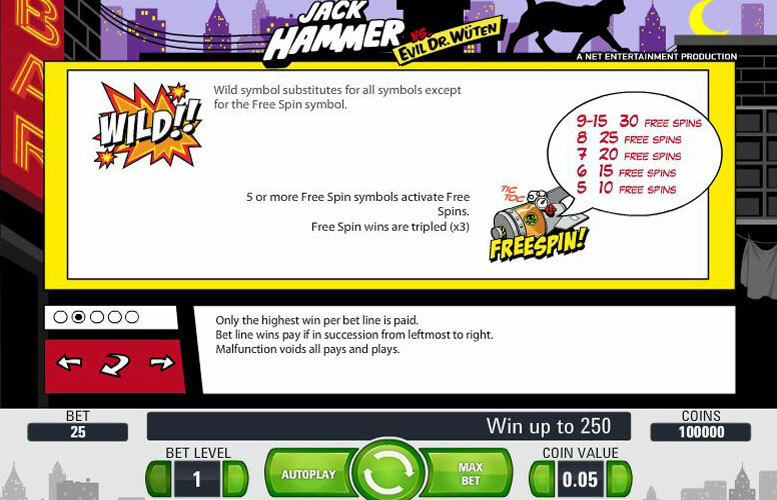 You must hit the 5 Jack Hammer combination to be entitled to the jackpot of 1000 coins. Evil Doctor Wuten Symbols, 5 of them, indicate a reward of 300 coins for the player. These jackpots are kind of low when compared to other slot machines but the top jackpot of 250,000 coins keeps things very interesting. 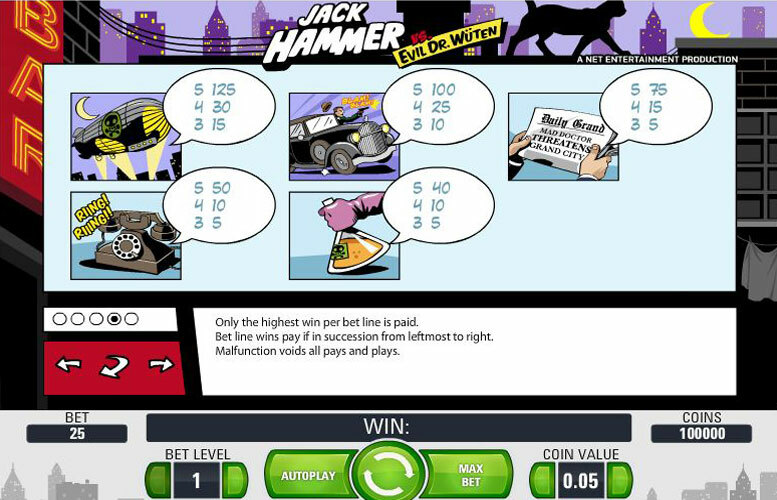 Jack Hammer allows the players to place a minimum bet coin value of 0.01 and a maximum bet of 1 on each pay line. There are 25 different paylines to activate and an impressive 10 different bet levels available making the max bet 250 coins per spin and the min 25 coins per spin. You aren’t forced to play all paylines at once but the more you play the better chance you have of creating winning combinations each time you spin the reels. Auto play and bet max features are both available. Wild Explosion: The Wild Explosion is the wild in the slot and can be substituted for other symbols in the game. It can not replace the Free Spin Bomb. Free Spin: The Bomb Free Spin is the scatter on the slot and it free spins between 10 and 30 in which all wins are x3. 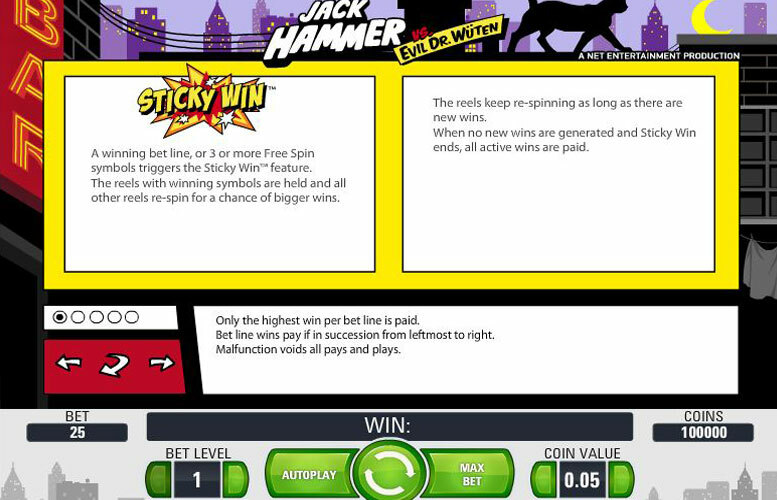 Sticky Wild: The Jack Hammer slot also has a Sticky Bonus. If you get 3 Bombs or more or any winning bet line you activate the Sticky Bonus Feature. During this feature all reels that contain winning combinations are held in place, much like pub style fruit machine games, and all others spin again to give you the chance of creating even bigger wins. This feature can be re-triggered leading to massive, massive payouts. Jack Hammer: If 3 Jack Hammers appear on the slot machine, the player would win 50 coins. If 4 of these appear on the slot, the player would be entitled to receive 150 coins and in case of appearance of 5 of these, the player would be rewarded with 1000 coins. Evil Doctor Wuten: If the player manages to get 3 Wuten Symbols on the pay line, he would win 50 coins. 4 of these would mean a reward of 100 coins and if the slot displays 5 of these the player would be rewarded with 300 coins. Assistant: 3 Assistants would entitle the slot player to a payout of 25 coins. Appearance of 4 means that the player would be rewarded with 50 coins with 5 of these entitling the player to a reward of 250 coins. Paperboy: Appearance of 3 Paperboy icons wins a payout of 15 coins, 4 of these on the active pay lines mean that the player would be rewarded with 50 coins and 5 would reward the player 200 coins. Doctor Wuten’s Airship: If the Airship appears x3, the slot player would win 15 coins, appearance of x4 would indicate a payout of 30 coins and finally 5 of these Airships would win the player 125 coins. Jack Hammer’s Car: The Car appearing 3 times indicates a payout of 10 coins, 4 times is 25 coins and 5 times in 100 coins. Daily Grand Newspaper: this icon pays 3x = 3 coins, 4x = 15 coins, 5x = 75 coins. Telephone & Poison: these two nearly have the same payouts with 3 paying 5 coin and 4 paying 10 coins. However 5 Telephones pays 50 coins whilst 5 of the Poison icons pays only 40 making it the lowest paying symbol on the paytable. This game has a rating of 4 / 5 with 635 total reviews by the users.